Summary: The history of early aviation and the US Airline Industry beginning when the Wright Brothers made the first powered airplane flight on December 17, 1903 and heralded the rapid progression of Air Commerce. The technical advances made during WW1 led to the realization of the potential of the airplane to the transportation industry and the achievements of aviation pioneers and innovators such as Glenn Curtiss, Donald Douglas, Allan Lockheed and William Boeing. The history of early aviation and the emergence of famous early aviators and pilots like Amelia Earhart, Bessie Coleman and Charles Lindbergh. The photographs and pictures of the Famous Pioneers of Early Aviation and the early Airline industry in the United States are a useful addition to the facts sheet. The names of the famous aviation pioneers are Orville Wright, Wilbur Wright, William Boeing, Amelia Earhart, Bessie Coleman and Charles Lindbergh. The following fact sheet contains interesting facts and information about Early Aviation for kids. Early Aviation History Fact 2: Zeppelins: In 1900 the Zeppelin Airship was invented by Count Ferdinand von Zeppelin. The Zeppelins were first used for air travel. In 1910, Zeppelins provided the first commercial air service for passengers. In WW1 German Zeppelin airships were then used as bombers, for reconnaissance missions and for propaganda purposes. Early Aviation History Fact 3: The Wright Brothers: The Wright Brothers first flew gliders but when on to design and build an engine and experimented with powered flight on a biplane. They called their biplane flying machine "The Flyer". The Wright Brothers achieved the first powered, sustained, and controlled flight of an airplane on December 17, 1903. The "first flight" photo depicts Orville piloting and Wilbur running at wingtip. The Wright Brothers were granted a patent in 1906, their 'flying machine' was called an aeroplane. In 1909 the Wright Brothers were awarded the Congressional Medal for their contribution to the world of their flying machine. Early Aviation History Fact 4: Orville Wright: Orville Wright (1871 - 1948) piloted the first powered airplane flight that flew 120 feet lasting 12 seconds over sand dunes near Kitty Hawk in Dare County, North Carolina on December 17, 1903. In 1920 Orville Wright went on to be appointed to the National Advisory Committee for Aeronautics (NACA, the forerunner of NASA). Early Aviation History Fact 5: Wilbur Wright : Wilbur Wight (1867 - 1912) flew the second powered airplane flight in the "Flying Machine" on the same day as his brother covering 852 feet over 59 seconds. Early Aviation History Fact 6: Charlie Taylor: Charlie Taylor (1868-1956) originally worked for the Wright Brothers at the Wright Cycle Company as a mechanic and bicycle machinist. Charlie Taylor, nicknamed the “Unsung Hero of Aviation”, built the engine that powered the Wrights’ first airplane. Early Aviation History Fact 7: Aero Club of America: The Aero Club of America was a social club formed in 1905 by wealthy industrialist Charles Jasper Glidden to promote aviation in America. The Aero Club of America issued the first pilot's licenses in the United States. Early Aviation History Fact 8: Aeronautical Division, Signal Corps: The Aeronautical Division, Signal Corps (August 1, 1907 – July 18, 1914) was established as the first heavier-than-air military aviation organization in history as a component of the U.S. Army Signal Corps. The Aeronautical Division obtained the first powered military aircraft in 1909, created flight schools to train its aviators, and initiated a rating system for pilot qualifications. Early Aviation History Fact 9: Glenn Curtiss: Glenn Curtiss (1878-1930) was a pioneer aviator, aircraft designer and manufacturer. In 1908, Glenn Curtiss piloted the first official public flight in the United States flying 1 mile. In 1909 Glenn Curtiss established America’s first aircraft manufacturing company. Early Aviation History Fact 11: Benjamin Foulois: Benjamin Foulois (1879-1967) nicknamed the “Father of the United States Air Force” was the third military aviator to be trained by the Wright brothers in 1910. Benjamin Foulois became chief of the AEF Air Service when the United States entered WW1. Early Aviation History Fact 12: Allan Lockheed: Allan Lockheed (1889-1969) achieved fame in 1910 with George Gates when the two men made the first dual-pilot controlled flight. Allan Lockheed went on to design the first successful twin-engine, 10-passenger seaplane in 1916. He founded the original Lockheed Aircraft Company in 1926. Early Aviation History Fact 13: Calbraith Perry Rodgers: In June 1911 Calbraith Perry Rodgers (1879 - 1912) became the first private citizen to buy the Model EX made by the Wright Brothers. Orville Wright gave him 90 minutes of instruction before he flew solo. Calbraith Perry Rodgers went on to persuade J. Ogden Armour, the owner of the grape soft drink Vin Fiz, to sponsor his attempt to fly coast-to-coast across the United States. The Vin Fiz Flyer became the first aircraft to fly coast-to-coast across America - the journey that took almost 3 months (September 17, 1911 - November 5, 1911) during which time Cal Rodgers survived sixteen air crashes. Early Aviation History Fact 14: Glenn L. Martin : Glenn L. Martin (1886-1955) was an American aviation pioneer who taught himself to fly and went on to design and build his own aircraft in his factory in California. Glenn Martin founded the Glenn L. Martin Company in 1912. In 1916 he merged his company with the original Wright Company, forming the Wright-Martin Aircraft Company and went on to design the MB-2 bomber that was used in WW1. Early Aviation History Fact 15: Harriet Quimby: Harriet Quimby (1875-1912) was the first American woman to earn a pilot’s license from the Aero Club of America in 1911. In 1912, Harriet Quimby became the first woman to fly across the English Channel. The following fact sheet continues with facts about Early Aviation for kids. Early Aviation History Fact 16: William Boeing: William Boeing (1881-1956) was an American aviation pioneer and entrepreneur who founded the Boeing Company on July 15, 1916. The Boeing Company became a major manufacturer of military and civilian aircraft and made him a multi-millionaire. Early Aviation History Fact 17: Wilbur Wright Field: Wilbur Wright Field, Riverside, Ohio was established in 1917 as a military installation and airfield used to train WW1 pilots and mechanics and to conduct Air Forces flight testing. Early Aviation History Fact 18: Aviation Section, Signal Corps: The Aviation Section, Signal Corps was established as the military aviation service of the United States Army from 1914 to 1918. Its task was to supporting the Army in combat after the United States entered World War I on 6 April 1917. Early Aviation History Fact 19: WWI and Aviation: WWI changed aviation forever. The Wright Brothers had only made the world's first powered flight just over a decade before - aviation was in its infancy. Airplanes were flimsy, there were no navigational aids, instruments were extremely basic, the cockpit was open to elements and there were no parachutes. In addition there was no air traffic control because there were no radio communications. And on top of all of these problems, the outbreak of WW1 created the urgent need for the aeroplane to be turned into a machine of war. The Allies fought against the countries of the Axis for control of the air, air-strikes, reconnaissance and mobility. Early Aviation History Fact 20: WW1 - The War Machines : As technology improved aircraft became war machines. The became more maneuverable, instruments more sophisticated and engines more powerful. It soon became possible to mount machine guns and bombs. Early Aviation History Fact 21: WW1 - Air traffic control: The U.S. Army installed the first operational two-way radios in planes during WW1 enabling a radio telegraph over a distance of 140 miles and establishing the system of Air Traffic control. The radio telegraph messages could also exchanged between planes in flight. Finally, in 1917, for the first time a human voice was transmitted by radio from a plane in flight to an operator on the ground. Early Aviation History Fact 22: WW1 - Pilotless Drones: The first pilotless drone was developed for the U.S. Navy in 1916 and 1917 by two inventors, Elmer Sperry and Peter Hewitt. The first unmanned flight in history occurred on Long Island on March 6, 1918. Early Aviation History Fact 23: Elmer Sperry: Elmer Sperry (1860-1930) was a brilliant American inventor, nicknamed the "Father of Modern Navigation Technology". He established the Sperry Electric Company in 1880 and is famous for the invention of the gyroscopic compass which made autopilot steering possible. Elmer Sperry made a significant contribution to WW1 technology building the first aerial torpedo in 1917, which became the first successful guided missile. Following WW1 Elmer Sperry developed the automatic pilot, which is now standard equipment on all commercial and military aircraft. Early Aviation History Fact 24: Peter Cooper Hewitt: Peter Hewitt (1861 – 1921) was an American electrical engineer and inventor who invented the first mercury-vapor lamp in 1901 and developed and tested an early hydrofoil in 1907. In 1916, Peter Hewitt joined Elmer Sperry to develop the Hewitt-Sperry Automatic Airplane, one of the first successful forerunners of the cruise missile. Early Aviation History Fact 25: Lawrence Sperry: Lawrence Sperry (1892-1923) was the third son of Elmer Sperry and founder of the Sperry Aircraft Company which he established in 1917. Lawrence Sperry developed the first amphibious flying boat in 1915 and added lights to it to enable pilots to make night flights. His contribution to the WW1 war effort continued with the invention of the 3-way gyrostabilizer to steer bombing aircraft. Early Aviation History Fact 26: WW1 - William "Billy" Mitchell: Billy Mitchell (1879-1936) was the one of the most famous U.S. aviators of WWI who is regarded as the "Father of the United States Air Force". Billy Mitchell commanded the largest concentration of aircraft in France during WW1. Early Aviation History Fact 28: United States Army Air Service: United States Army Air Service (May 24, 1918–July 2, 1926) was established towards the end of WW1, replacing the Aviation Section, Signal Corps, and was the forerunner of the United States Air Force. 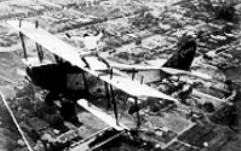 Early Aviation History Fact 29: U.S. Air Mail service: The first scheduled U.S. Air Mail service began on May 15, 1918, using U.S Army Curtiss JN-4HM "Jenny" biplanes. The early aviation industry received a boost in 1925 when the Kelly Act was passed, authorizing postal officials to contract with private airplane operators to carry U.S. Air Mail. Early Aviation History Fact 30: Elmer “Archie” Stone: Archie Stone (1887-1936) was a United States Coast Guard aviation pioneer and in 1919 the pilot of the first successful trans-Atlantic flight with Lieutenant Commander A. C. Read as the navigator. Early Aviation History Fact 31: Jimmy Doolittle: Jimmy Doolittle (1896-1993) was an American aviation pioneer who served as the U.S. Army Air Corps’ chief of experimental flying and as a flight instructor in WW1. Jimmy Doolittle was one of the most famous pilots during the inter-war period. He made the world’s first totally blind flight relying entirely on a directional gyro, sensitive altimeter, artificial horizon and radio navigation. Jimmy Doolittle was awrded the Distinguished Flying Cross by the U.S. Army. On April 18, 1942, in WW2, Jimmy Doolittle led the first U.S. air attack on Japan. Early Aviation History Fact 32: Early Aviation after WW1: The Technological advances in the Airline Industry and in aviation during during WW1 led to the realization of the potential of the airplane to the transportation industry. But the majority of the American public viewed early, flimsy 'flying machines' or airplanes as dangerous fads and the aircraft industry failed to expand as expected. Americans preferred the relative safety of automobiles and the car industry boomed. Refer to Henry Ford and the Model T.
Early Aviation History Fact 33: Jennys: During WW1, the United States manufactured a large number of Curtiss JN-4s (nicknamed Jennys) to train aviators. Almost every WW1 U.S. pilot learned to fly using the Curtiss airplane. After the war the U.S. federal government sold off the surplus Jennys, for a fraction of their initial cost. This enabled ex-ww1 pilots to purchase JN-4s (Jennys) for as little as $200. Many of these early aviators set up businesses as Barnstormers. Early Aviation History Fact 34: Barnstorming: In the 1920's barnstorming was a popular form of entertainment for many Americans. Pilots negotiated with a local farmer to use a field as a temporary runway and put on an air display show for the locals. The stunt pilots were daredevils who flew the airplanes were called Barnstormers and performed a variety of stunning aerobatic maneuvers and death-defying stunts such as spins, loop-the-loops, dives and barrel rolls. Aerialists were also members of the Flying Circus show and performed terrifying feats of wing walking and stunt parachuting. Early Aviation History Fact 35: Dollar Airplane Rides: The Barnstormers gave many Americans their first taste of flying offering airplane rides for just one dollar. There were no safety regulations and no seatbelts in the open aircraft but the thrilling experience of the joyrides gave many Americans the 'flying bug'. Early Aviation History Fact 36: Bessie Coleman: Bessie Coleman (c.1892–1926) was the first African American woman to receive an aviator's international pilot license and the first woman to become a stunt pilot. She performed in her first air show in September 1922 in Garden City, Long Island. Early Aviation History Fact 37: Donald Douglas: Donald Wills Douglas, Sr. (1892-1981) was an aeronautical engineer and manufacturer who founded the Douglas Aircraft Company in 1920 after working for Glenn Martin as chief engineer, he formed his own company in 1920. Early Aviation History Fact 39: Amelia Earhart: Amelia Earhart (1897-1937) was a famous female aviator who had her first flying lessons in 1921. She became the first female pilot to complete a solo flight across the Atlantic Ocean in 1928. In 1937 Amelia Earhart attempted a flight around the world. She disappeared over the Pacific Ocean on July 2, 1937, en route to Howland Island, and was never heard from again. Early Aviation History Fact 40: First Nonstop Transcontinental Flight: In 1923 the first nonstop transcontinental flight was made by John A. Macready and Oakley Kelly who flew a single-engine Fokker T-2 nonstop from New York to San Diego, a distance of just over 2,500 miles in 26 hours and 50 minutes. Early Aviation History Fact 42: Clyde Cessna: Clyde Vernon Cessna (1879-1954) was credited as one of the Heroes of Aviation. He was American aircraft designer, aviator, and founder of the Cessna Aircraft Corporation and co-founder of the Travel Air Company. In 1928, he built the first cantilever plane in the United States and he created Cessna Aircraft to manufacture them. Early Aviation History Fact 43: William Powell "Bill" Lear: Bill Lear (1902-1978) was a brilliant inventor and businessman. Lear developed radio direction finders, and the first fully automatic aircraft landing system and the automatic pilot. He founded the Lear Jet Corporation in 1963. 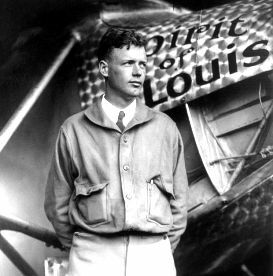 Early Aviation History Fact 44: Charles Lindbergh: Charles Lindbergh (1902-1974) was one of the most famous aviators in the history of aviation after completing the first solo, non-stop transatlantic flight in history on May 20, 1927. His plane was a Ryan monoplane named the Spirit of St Louis which he flew from Long Island, N.Y., The 3,610 mile flight to Paris, France took 33 hours and 30 minutes. Refer to Charles Lindbergh Transatlantic Flight and the Lindbergh Kidnapping. Early Aviation History Fact 45: WW1 : The aviation industry received another boost when the 1926 Air Commerce Act was approved on May 19, 1926 establishing a bureau to enforce procedures for the licensing of aircraft, engines and pilots. Early Aviation History Fact 46: Airlines: By the end of 1928, 48 airlines were serving 355 American cities. Many of the names of Famous American Early Aviators are detailed on the following list. The article on the Early Aviation provides detailed facts and a summary of the most important events and dates in the history of the United States - a crash course in American History. The following video will give you additional important facts, history and dates about the personal and political lives of all the US Presidents.